The heads of state and heads of government of the 28 North Atlantic Treaty Organization countries gathered in Poland last Friday and Saturday (July 8-9) for what many consider the most important NATO meeting since the end of the cold war. 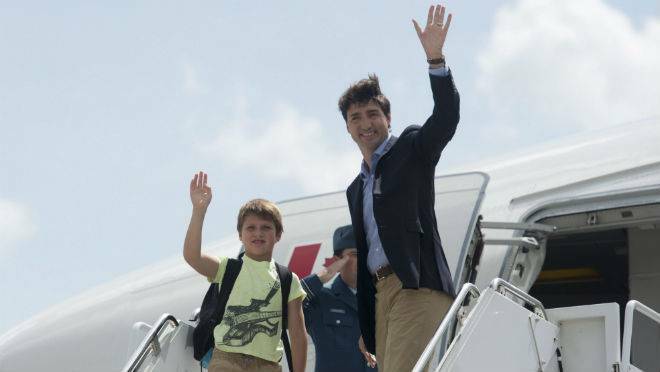 Hence, many were surprised to see Canada’s superstar Prime Minister Justin Trudeau arriving with his 9 year old son Xavier. But Justin also got an early introduction to the world of diplomacy and global affairs. Imagine the shock 40 years ago when the late Pierre Elliott Trudeau showed up with eight year-old Justin to meet the Iron Lady, British Prime Minister Margaret Thatcher. Surely, his father had a profound impact on him and his influence got him to become Prime Minister. A man of integrity and conviction, Pierre Trudeau cherished the importance of universal human rights, responsible citizenship, care for the environment and Canada’s role in the world. These are the focus of the Pierre Elliott Trudeau Foundation, an independent and non-partisan charity established in memory of the Late Right Honourable Pierre Elliott Trudeau. These priorities also come out as important for Justin Trudeau and we can foresee that Xavier will someday work towards them as well. Not everyone can have a Prime Minister as a parent but all young people should have access to education about global issues. Education is the critical first step to transform individuals into engaged citizens and actors of change in their communities. The “Education is a Window to the World” program run by The Bridge Foundation engages opinion leaders and youth on sustainable development and global issues.